I am teaching at 2 retreats this fall and one of the sessions is on shame. Thankfully I guess, shame is not an issue I have had to deal with a lot so it is the one I am least familiar with. 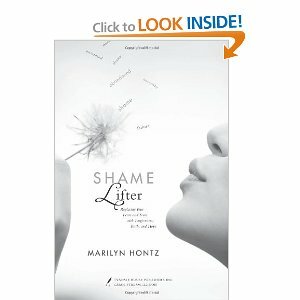 In preparation for the retreat I have been reading the book, Shame Lifter, by Marilyn Hontz. Wow!! I just cannot say enough good about this book! My copy is all highlighted and dog-earred and has given me so much food for thought that sleep has been somewhat illusive these days. I am so thankful that I felt impressed to choose this book out of all the ones I looked at on Amazon during my search for resource material! If this is an area you struggle with, I highly recommend you check it out!! Praying you do read it, friend! My copy is all dog-eared and high-lighted! Thanks for your gracious comments about my book, Shame Lifter. And thanks for speaking out on this subject of shame. It's not something we talk about very much, but I believe it is responsible for the many negative lies we believe about ourselves. A verse that is meaningful to me is Psalm 119:29 (NLT), "Keep me from lying to myself; give me the privilege of knowing your instructions." (It's so easy to lie to ourselves!) Thankfully the Lord longs to set us free from this destructive type of shame. He offers hope, freedom and lightness of soul. God bless you as you continue to help women understand their worth in Jesus Christ!